Individual posts can be assigned to a primary category by installing the Easy Primary Category plugin. 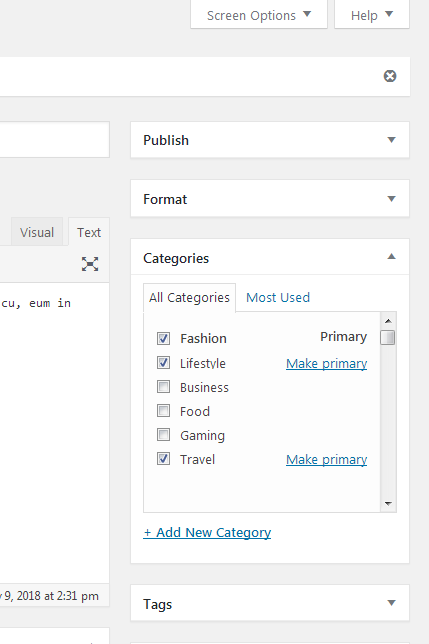 This is a very lightweight plugin allowing you to select one category to be the primary category of a post, if the post is assigned to more than one category. The plugin can be installed and activated from within your WordPress dashboard. Click on ‘Begin activating plugin’ to download and install the Easy Primary Category plugin from wordpress.org and then once the plugin has been installed, click on ‘Activate’ to activate the plugin. The plugin can also be installed by navigating to Plugins > Add New and searching for Easy Primary Category, or manually by downloading the plugin zip file from wordpress.org and uploading/installing it yourself. If you prefer not to make use of this plugin, simply click ‘Dismiss this notice’ and the notification will be removed from your dashboard. Where you have a post that is assigned to more than one category, ‘Make primary’ will be visible next to the category name. Simply click ‘Make primary’ to make that category the primary category of the post you are editing. 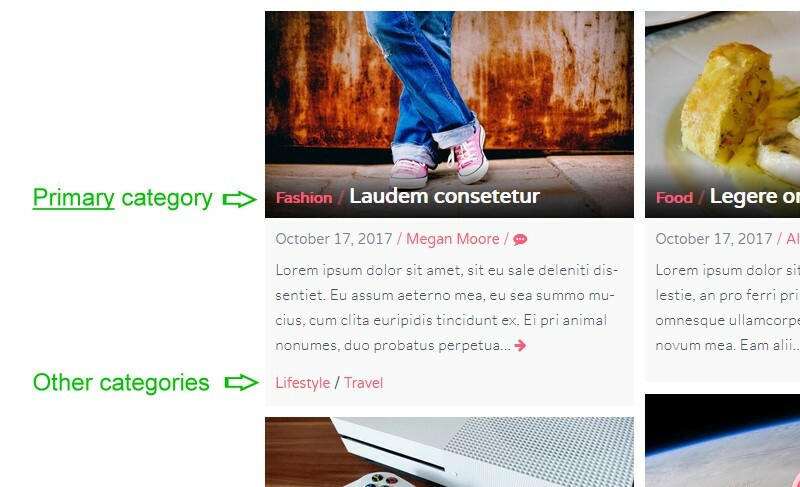 How does Latest theme display primary category? In your post archives (blog home, categories, date archive, search results etc), the primary category is displayed right before the post title seperately from all other categories, with other categories displayed below the post excerpt. On the individual single post view, the primary category is again displayed seperately from the full list of all the post’s categories. If a post is only assigned to one category, then that category will be displayed as the post’s primary category. If a post is assigned to multiple categories, and you don’t make use of the Primary Category, then the first category when listed alphabetically will be displayed as the post’s primary category.